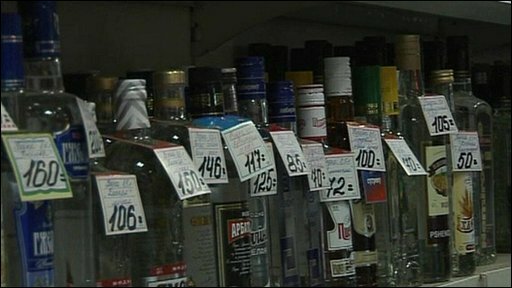 President Vladimir Putin has ordered the Russian government to curb rising vodka prices. Vladimir Putin, who has been hit by increasing economic woes, said that high prices encouraged the consumption of illegal and possibly unsafe alcohol. Russia’s currency, the ruble, has lost value recently due to falling oil prices and Western sanctions. The country’s former finance minister warned that Russia would enter recession in 2015. Vladimir Putin, who promotes a healthy lifestyle, asked “relevant agencies” to think about what he said, adding that the government should fight against the illegal trafficking of alcohol. According to a leading university study last year, 25% of Russian men die before reaching their mid-50s, Reuters reports. Alcohol was found to be a contributing factor in some of these early deaths. Since 2013, the Russian government-regulated minimum price of half a liter (17 oz) of vodka has increased by around 30% to 220 rubles ($4.10), Reuters adds. Annual inflation in Russia currently stands at 9.4%.